Rep. Gregg Haddad with Mansfield students at the State Capitol. 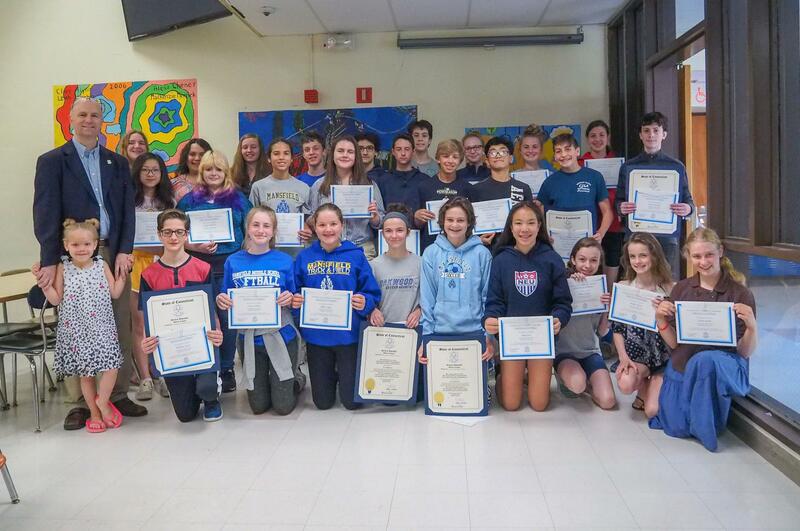 Congratulating a group of Mansfield students for their excellent work in essay writing, Rep. Gregg Haddad presents official General Assembly Citations to the students during a recent visit to the State Capitol. The topics students chose to write about included proposals for new regulations and laws on firearm storage, minimum wages for workers and bans on plastic bags. Haddad sponsors the essay challenge each year for eighth graders in Mansfield. Students are asked to write an essay that makes an effective case for changing a law or enacting a new one. This year and in past years, Haddad has introduced the best ideas as bills in the General Assembly. “They write about great ideas for the future of this state,” Haddad said.